I absolutely love being around my friends and family no matter what we‘re doing. I like girly stuff like shopping and getting some sun, but my newest favorite hobby is sailing. What are your favorite dance roles, and why? My favorite role was portaying one of the Gossips in a production of La Fille Mal Gardée, because the role was focused on really finding my character rather than just thinking about the technique. With this role, I learned how to portray a character with all of myself, and not rely only on the steps! Have you ever had an injury? How did you deal with it? Yes, I’ve had an injury. It was really frustrating because I wanted it to heal much more quickly but there wasn’t anything I could do but to R.I.C.E. (rest, ice, compress & elevate). I didn’t do well with the resting part. What part of the upcoming American Midwest Ballet season are you looking forward to the most? I’m looking forward to our debut season. I can’t wait for a fresh start with our brand new company. I love innovative, lively and entertaining new things — and that’s exactly how I feel American Midwest Ballet will be! My favorite restaurant is Matsu Sushi. My favorite roll there is the caterpillar roll. It is made with avocado – the best. It’s adorably cute. It really looks just like a green caterpillar! 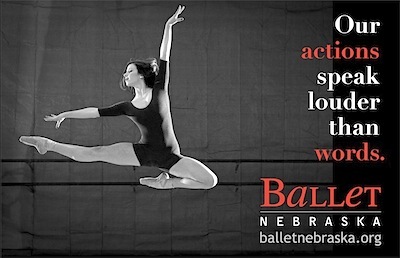 From postcards to billboards, Natasha’s athletic yet graceful dancing is featured in many of American Midwest Ballet’s promotional materials.